WaterNSW manages a complex network of dams, storage's and pipelines to supply water to its customers. Find out more about this system by using the interactive map here. Locate our major dams and reservoirs, water supply weirs and see the boundaries for the drinking water catchment and Special Areas. See also where water filtration and recycling plants fit into the overall water supply system - infrastructure not managed by WaterNSW, but critical parts of the system. 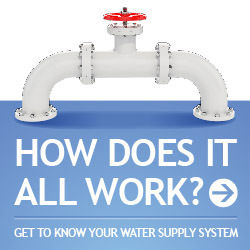 If you're curious how the overall system connects and comes together, view our water supply graphics.